Trailheads: Rover Run Dog Park Trail Head or Poudre Ponds Recreational Fishery Trailhead. 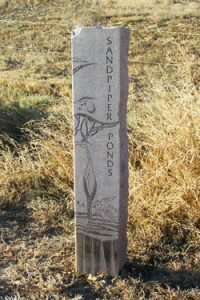 Description: This section of the trail runs from Rover Run Dog Park to the Poudre Ponds Recreational Fishery on 35th Avenue. Heading north along the trail from the Dog Park, you will cross some farmland. Within this area you cross a railroad track. Take caution when crossing the track, you may want to dismount if riding. You will see active gravel pit mining along this section with large conveyor systems to move the gravel out of the pit. The gravel pit is fenced off for your safety. Features: Rover Run Dog Park: Dogs are allowed to run free inside a large 3-acre fenced area. The dog park has benches, a portable restroom and receptacles for waste bags. Be sure to bring water for Fido. The dog park is open during daylight hours only. The City of Greeley requests that you follow the rules of the dog park and properly dispose of your pup’s waste. Geology: This is an excellent section to observe how the pits left from the gravel mining fill in with water and become sanctuaries for birds over time. While the mining is taking place, they run pumps continuously to keep the groundwater from filling in the area.